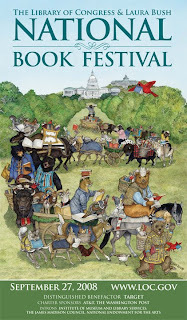 Before leaving for Book Expo America, I received an email from Jill at Rhapsody in Books, who wanted to know about the differences between festivals like the National Book Festival in Washington, D.C., and Book Expo America. She’s full of great ideas, so I took her up on it. BEA is a publishing industry-sponsored event to talk about the new fall releases, current releases, the state of the publishing industry, and an all around networking event for those in the publishing industry. 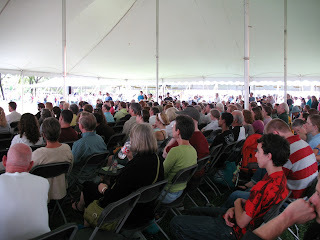 Local book festivals, like the one in D.C., are often supported through donations from organizations like newspapers, retailers, etc., and provide a venue through which people can hear authors talk about books, themselves, reading, etc. ; meet their favorite authors; and buy books they normally would not have heard of whether new to the market or banging around bookstores for a few months. I can’t tell you which event to attend or which event is right for you, but I can give you some guideline questions to answer and what I would recommend. 1. Do you want to meet the publicists, authors, publishers, etc., you’ve been working with? BEA would be your best option for this because there are booths and you can set aside specific times to talk with these people and discuss books, upcoming releases, etc. However, you can talk with authors for short spurts at book festivals as well, but if you want more one-on-one time, head to BEA. 2. Interested in publishing trends on the horizon or learning more about e-readers, online publishing, e-publishing, etc.? BEA will provide you with panels chock full of information, and in some cases, so much information that your head will hurt. It depends on what you want out of your blog and where you see the future of your blog heading as to whether this information will be useful or important to you. 3. 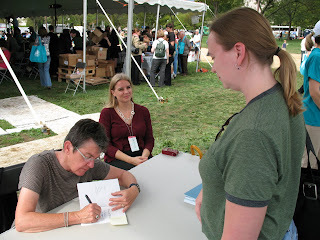 Do you want to meet your favorite authors, chat with them, get signed books? Either BEA or book festivals or even author signings can achieve these goals. Just go with what suits you and your budget most. If there are authors visiting your area that you love, see them. If the authors you love don’t visit your area but go to BEA, get on a plane, train, or drive into NYC and see them. In this case, you would want to attend BEA, rather than a book festival because more than likely you have to pay for the books. 5. Want to meet with other book bloggers in real life? Again, this depends on where you live and who you know that lives near you and blogs about books. If you live in a well populated blogging community, your best option is to meet with them through a meet-up you agree to or at the local book festival because trying to find your blogging buddies in BEA without a plan is like looking for a contact lens beneath a million people’s shoes. 6. Interested in what the publishing industry is really like? You’re going to want to be at BEA, especially when tours of the offices are offered and you get to meet with publishing industry staffers to discuss how bloggers fit into the equation or how you can get a better working relationship with publishers. However, if there is a large group touring these facilities, etc., it may be hard to glean out the information you are looking for specifically unless you have one-on-one time. Regardless of what avenue you choose, just remember to make the most of these events for you and your blog. I tend to be in awe of everything and do follow up emails with my questions. Its good to remain in contact with everyone you meet, even if it is to just say how lovely it was to meet the person. I attend both formats because I’m interested in the publishing industry and where its going, but I also like celebrating reading, which is what I believe book festivals focus on for the most part. One drawback for me at BEA every year has been the lack of poetry discussion or promotion. And since one of my goals for my blog is to raise interest in poetry, my job will be continuous until BEA starts talking poetry, though I was glad to see Graywolf Press in a booth this year and some of their poetry selections. What are your thoughts on book festivals versus Book Expo America? 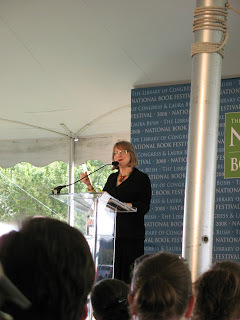 As many of you may have heard, The National Book Festival 2009 commences this weekend–Saturday, Sept. 26. Mom and I will be going to see the following authors, though there may be some conflicts. . . we’ll work it out. 4:15 to 5 PM Tim O’Brien, author of some of the best Vietnam War literature out there. What authors are on your schedule? 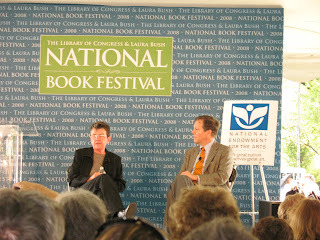 The 2008 National Book Festival will be held in Washington, D.C., this weekend–Sept. 27 between 10 AM and 5:30 PM. 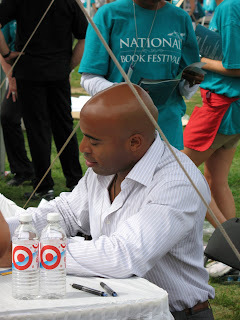 More than 70 authors are expected to attend the Book Fest, ranging from Salman Rushdie to former New York Giants running back Tiki Barber. 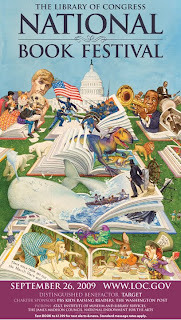 Each year the Library of Congress gathers some of the best authors out there to bring their books and their stories to D.C. to celebrate the joys of reading. 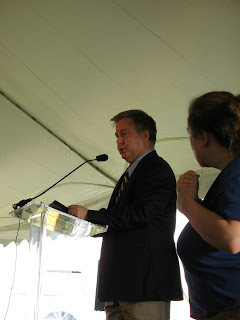 I’ve met Tim O’Brien, Anita Shreve, and many others when I have attended this event. 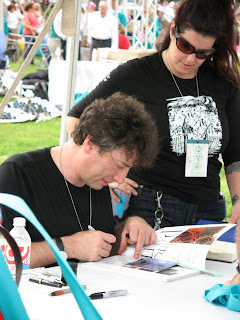 Not only can you get autographs of their latest books, but most authors are willing to sign older copies as well. Authors will be broken down by Pavilion Genre and will have a scheduled time to speak in that pavilion, so check out the schedule here. I’m excited because our new Poet Laureate Kay Ryan will be there along with First Lady Laura Bush. 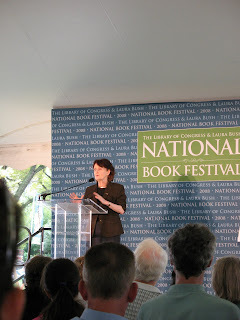 If you cannot attend the festival, why not spend the day on the 2008 National Book Festival website listening to podcasts from some of the authors attending the Book Fest? 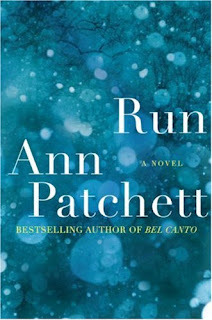 Additionally, for those of you who have read Run by Anne Patchett, Book Club Girl is hosting a call in show about the book with the author. Here’s the link to the audio show online, sign up and join in the discussion. Ms. Patchett will be available to answer questions through the call in number: 347-945-6149. The show starts at 7 PM EST.